The 2012 Belgian Grand Prix (officially the 2012 Formula 1 Shell Belgian Grand Prix) was the twelfth race of the 2012 Formula One Season and the 68th Belgian Grand Prix, the 57th time as the round of the Formula One World Championship. The race was held on September 2nd at the Circuit de Spa-Francorchamps, the 45th F1 race held at the venue. The race was won by Jenson Button who led the race from start to finish, followed by Sebastian Vettel in second and Kimi Räikkönen in third. The result leaves Fernando Alonso, who retired on lap 1, leading the World Championship by 24 points from Red Bull driver Sebastian Vettel. Red Bull continue to lead the Constructors' Championship by an increased margin of 53 points from McLaren-Mercedes. After the race, the stewards awarded a one-race suspension, active at the Italian Grand Prix, to Lotus-Renault driver Romain Grosjean for causing a collision at the first corner which led to the retirement of himself, Lewis Hamilton, Fernando Alonso, Sergio Pérez and Pastor Maldonado. Following the extended summer break, the drivers will approach the Belgian Grand Prix with Ferrari driver Fernando Alonso leading the World Drivers' Championship by 40 points from Mark Webber of Red Bull-Renault. Red Bull lead the Constructors' Championship. The event will be a first Belgian Grand Prix for F1 rookies, Jean-Éric Vergne and Charles Pic, both of whom have experience of the Spa-Francorchamps circuit from other racing series. There are no major changes to the circuit from the 2011 event, and the DRS zone is again expected to be from the exit of Eau Rouge/Radillon, along the Kemmel Straight to the braking zone for Les Combes, with the detection point before the entry to Eau Rouge. Chilean driver, Eliseo Salazar will make his debut as the drivers representative on the Stewards board in Belgium. Salazar raced in Formula One from 1981 to 1983 for the March, Ensign, ATS and RAM teams. However he was more noted as a Sports Car and IndyCar driver in his later career. Salazar was also one of the former F1 drivers competing in the GP Masters from 2005-2006. In the first practice session Valtteri Bottas replaced Bruno Senna in the second Williams, Jules Bianchi replaced Nico Hülkenberg in the Force India and Dani Clos was piloting the HRT instead of Narain Karthikeyan. With a heavy downpour of rain on the circuit there was limited track time for the drivers. This meant that there was a rather unusual final result for the session time sheets. Kamui Kobayashi in the Sauber lead the timesheets with Pastor Maldonado in the Williams second followed by the Toro Rosso's of Ricciardo and Vergne. Mark Webber was top of the championship runners in 5th with Red Bull teammate Sebastian Vettel in ninth. The McLaren's of Lewis Hamilton and Jenson Button were 15th and 16th respectively. Both Ferrari and Lotus opted to do only very limited running, completing only a few basic installation laps. The Ferrari of Felipe Massa was the only car who did not set a lap time, a suspected engine failure prevented him from completing his first lap. Of those that did brave the conditions, Kobayashi, Maldonado, Ricciardo, Webber and Button had spins down at Les Combes. The afternoon practice session suffered from similar torrential conditions as the morning session. Free Practice 2 however saw even less activity in its session in the first. Only 18 of the 24 drivers ventured out on track and only 10 of these drivers completed timed laps in the very dying minutes of the session. On top of the 10 drivers who set timed laps was a surprising Charles Pic, for the first time setting the fastest time in a Formula One practice session for himself and the Marussia team. Of the championship contenders only Fernando Alonso set a timed lap putting his Ferrari third on the timesheets. Alonso's teammate Felipe Massa was the only driver who participated in both Friday Practice Sessions who did not set a lap time in either session. The Lotus drivers of Kimi Räikkönen and Romain Grosjean only went out very briefly in the first practice session, however in the second session they did not leave the garage at all. Other notable names who did not make it out on track was the Red Bull of Mark Webber, the Caterham of Vitaly Petrov and both the HRT drivers of Pedro de la Rosa and Narain Karthikeyan. The Saturday free practice session was in stark contrast to the Friday practice sessions. The Sun was out and the track was extremely busy as the drivers and teams attempted to gather as much data on the track that was not able to be gathered due to the rain on the previous day. Nico Rosberg in the Mercedes had a suspected gearbox failure fifteen minutes into the session which caused him to stop out on track. With barely any running in any of the practice sessions his retirement from the session put him on the back foot for qualifying and the race. At the conclusion of the session, it was championship leader Fernando Alonso leading the way in his Ferrari. His nearest championship rivals in the Red Bull's saw Mark Webber and Sebastian Vettel finish seventh and ninth respectively. Kimi Räikkönen demonstrated the Lotus pace finishing the session just behind Alonso in second. The Sauber team produced impressive lap times with Sergio Pérez and Kamui Kobayashi finishing a strong third and fourth. Lewis Hamilton however did not produce any strong lap times finishing the session in twelfth whereas his teammate Jenson Button finished the session fifth. The sun was shining once again with no threat of the torrential rain that had affected the Friday Practice sessions. The session saw the Williams of Pastor Maldonado as the fastest man on track just pipping the McLaren of Jenson Button to the top of the time sheets. This was in contrast to their teammates with Lewis Hamilton struggling in fifteenth and Bruno Senna in seventeenth. Nico Hülkenberg also showed promise putting his Force India third just ahead of the Ferrari of Championship leader Fernando Alonso. Hülkenberg however was involved in an incident where one of his hot laps were allegedly blocked by the fastest driver Pastor Maldonado, the incident would be investigated by the stewards after the conclusion of the qualifying sessions. The constructors championship leaders, Red Bull appeared to be struggling with Sebastian Vettel finishing tenth and Mark Webber finishing fourteenth. Nico Rosberg was the big loser in the session though, he failed to put together a competitive lap time and finished the session eighteenth and within the drop out zone. It was always going to be a struggle for the German, he had done near to no dry weather driving on the circuit after the circuit wash out on Friday and his gearbox failing in the opening minutes of the first dry practice session on Saturday. 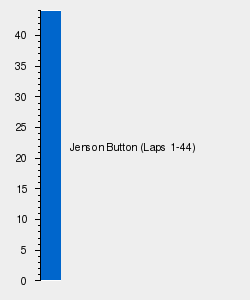 Jenson Button continued to demonstrate his qualifying pace putting in the fastest lap time of the session. Fastest man in the first session Pastor Maldonado struggled and only just managed to put his car in tenth place and into the final session of qualifying. The same could not be said of his teammate however, Senna struggled in his Williams which saw him have a large spin at Pouhon. He finished the session in seventeenth and last place. Both Sauber's appeared to be competitive with Sergio Pérez finishing the session second and Kamui Kobayashi finishing fifth. Nico Hülkenberg who had appeared very strong in the first session struggled in the second qualifying session and only put his car into twelfth position. He was beaten by teammate Paul di Resta who had made into into Q3 after ironically struggling in the first session. However the biggest name to not make it into the final qualifying session was reigning World Champion Sebastian Vettel. Vettel had been struggling with his car all weekend and finished a disappointing eleventh putting his Red Bull just ahead of Hülkenberg and Michael Schumacher who would be starting his 300th Grand Prix from a disappointing thirteenth. McLaren, Lotus and an impressive Sauber were the only teams to get both drivers into the final qualifying session. Jenson Button continued to set the benchmark time and dominated the final qualifying session to take his first pole for McLaren and his first since the 2009 Monaco Grand Prix with Brawn. Kamui Kobayashi scored his best ever qualifying position finishing second and putting himself on the front row next to Button. His teammate Sergio Pérez also finished an impressive fifth. Championship leader Fernando Alonso did not demonstrate any strong pace throughout all of qualifying, yet crucially with the exception of the Lotus driver Kimi Räikkönen who starts fourth he manages to qualify ahead of all his nearest championship contenders. Behind both Button and Kobayashi starts Pastor Maldonado who had generally been quick throughout the weekend putting himself and Williams in a prime position to fight for the lead of the race on Sunday. After the second practice session on Friday it was confirmed that Mark Webber would suffer a five place grid penalty for an unscheduled gearbox change. This meant that he would start the race in twelfth position just behind teammate Sebastian Vettel who would start tenth. With both their drivers in for a likely chance of winning the drivers title and the Red Bull team leading the constructors title it had put the team and the drivers at a serious disadvantage after qualifying as they were the lowest qualifying team and drivers of the likely championship contenders. Nico Rosberg would also receive a five place grid drop. His gearbox failure in the Saturday practice meant that the team was forced to replace the gearbox before it had finished its required lifespan. Rosberg would now start twenty third and on the last row of the grid starting ahead of only the HRT of Narain Karthikeyan. Starting so far back on the grid and only completing a very limited number of laps on the circuit would make it difficult for Rosberg to score a strong result for the team. Pastor Maldonado's strong third place on the grid was under threat after he had allegedly blocked a flying lap from Nico Hülkenberg in the first qualifying session. The stewards eventually concluded that Maldonado was guily of blocking Hülkenberg and therefore handing him a three place grid penalty meaning that Maldonado will start sixth on the grid. Therefore promoting four time Belgian GP winner Kimi Räikkönen to third with Sergio Pérez and Fernando Alonso starting fourth and fifth respectively. As the cars lined up on the grid, trouble already seemed to be brewing before the race even got under way. Kamui Kobayashi's Sauber appeared to be smoking and overheating on the grid, a worrying and ominous thought before the race had even begun. Pastor Maldonado who started 6th then jumped the start after letting go of the clutch before the lights went out and moved up to third behind Kimi Räikkönen and Jenson Button. Most of the drivers had been startled and distracted by Maldonado's suspiciously good start which would have dire consequences as they headed down to turn 1. The Lotus of Romain Grosjean veered sharply across to the right hand side of the track, pushing the McLaren of Lewis Hamilton onto the grass at the side of the track. Hamilton losing control of his car from this manoevure slammed into the back of Grosjean as they neared the first corner slingshotting Grosjean into the back of Sergio Pérez in the Sauber and then launching him over the top of championship leader Fernando Alonso. The other Sauber of Kamui Kobayashi was squeezed out in the melee hitting the back of the stricken Ferrari of Alonso and then was hit behind by the out of control Hamilton. Maldonado had taken damage as well when he was hit in the rear by Pérez. Six cars had been damaged in the startline accident and of those six only Kobayashi and Maldonado were able to drive away. Maldonado however retired later on lap three when the damaged appeared to be terminal. Kobayashi was the only driver of the drivers involved in the accident to finish the race albeit with a massive hole in the right hand side of his car and struggling throughout the race to finish a disappointing 13th. There was a worry in the aftermath of the accident with Alonso laying motionless within the car but eventually exited although suffering from a bit of shock and a slightly injured shoulder. The accident however did benefit some drivers, with the safety car coming out to allow the marshalls to clear away the carnage of the first corner, Heikki Kovalainen found his Caterham in a strong 10th position after the first lap. Whilst Nico Hülkenberg was 3rd followed by his Force India teammate Paul di Resta, then it was Michael Schumacher and Felipe Massa. The safety car pulled in at the end of lap four and remarkably once again there was another incicident at the first corner when Kovalainen lost control of his car spinning to the back of the field. Unable to make use of his great start and had it all to do once again. At the front Button sped away into the lead while Hülkenberg was able to get passed Raikkonen for second whilst Schumacher managed to pass di Resta for third. Unable to get his tyre temperatures up to speed, Raikkonen struggled and dropped behind Schumacher. Both the Red Bull drivers had lost time in the first corner accident with Mark Webber and Sebastian Vettel 10th and 11th. Vettel however put in some great driving passing his teammate, the two Toro Rosso's of Jean-Éric Vergne and Daniel Ricciardo both of whom benefitted from the start line accident then passing Di Resta and Felipe Massa. Di Resta out himself out of the running when he began to suffer from severe tyre degradation and was forced to pit quite early. Kimi Räikkönen was also struggling for speed and he too came into the pits quite early severely damaging his hopes of challenging race leader Jenson Button. This put reigning champion Sebastian Vettel into third place just behind the feisty Michael Schumacher hoping for a strong result in his 300th Grand Prix. The two World Champions dueled for several laps until lap 19 when Vettel attempted to pass Schumacher at his favourite passing position at the Bus Stop chicane, the last corner of the circuit. Schumacher defended well and looked to have the corner only for him to surprisingly dart across the track and into the pits nearly crashing into Vettel as he did so, the rather brash manoveaur nearly took both cars out of the race and was see a steward investigation after the conclusion of the Grand Prix.. There were two pit lane incidents investigated during the race. Whilst completing his first pitstop Heikki Kovalainen was released from the pits a little too early and nearly hit the incoming HRT of Narain Karthikeyan. Not long after Mark Webber was also released a little to early from the pits and was a little too close to comfort with Felipe Massa in the Ferrari. The stewards fined Caterham 10 000 Euros for the incident whilst Webber got away unpenalised. Entering the final stages of the race, Narain Karthikeyan spun into the barriers on Lap 30 after a wheel in his recent pitstop was not properly attached sending him into the barriers at Les Combes. Schumacher was still running third significantly behind Sebastian Vettel and race leader Jenson Button. Schumacher was leading a train of cars with Raikkonen, Hülkenberg, Webber and Massa snapping at his heels. Schumacher was much slower on the corners being passed by Raikkonen several times at the Bus Stop Chicane but with the advantage of the double-DRS stormed passed him again at the Kemmel Straight. Finally on lap 34 Raikkonen gets the better of Schumacher for the final time snapping past him at Eau Rouge and then proceeding to pull away. Schumacher and Hülkenberg continued to battle for 4th position. Hülkenberg passed Schumacher a few times but like Raikkonen, Schumacher was able to storm past him at the Kemmel Straight. Schumacher however was struggling and gave up his plight pulling into the pits for new tyres forcing him to drop to seventh. Any hope of him getting back into the fourth place battle was lost when he lost 6th gear and was forced to limp around the track for the rest of the race. Lap 36, the same lap that Schumacher pitted saw Felipe Massa finally managing to pass Mark Webber for 5th place putting his Ferrari into a relatively strong position. Further down the pack Nico Rosberg in the second Mercedes had put in a good drive to get into 8th position after starting 23rd however like his teammate he was suffering from tyre degradation and was forced to let the two Toro Rosso cars of Jean-Éric Vergne and Daniel Ricciardo past and then was soon followed by the Force India of Paul di Resta and therefore dropping out of the points. At the front Jenson Button had driven a flawless race leading from lights to flag without being challenged at all. His race win had put him back into title contention. Sebastian Vettel finished 2nd in the race after making his two stop strategy work passing numerous cars out on track to finish a strong 2nd place. Kimi Räikkönen whilst quicker than Vettel at the end of the race had lost too much time dueling with Schumacher to put in any serious challenge finishing the race in third. Nico Hülkenberg put in one of his best performances as a race driver to finish in his finishing positon to date with a 4th place finish. He was followed by the resurgent Massa putting in his best performance of the season making the most of Alonso's retirement, then Mark Webber, a disappointing result not being able to maximise the retirements of championship rivals Fernando Alonso and Lewis Hamilton. Then Michael Schumacher, a disappointing result considering his pace and then a double points finish for Toro Rosso, scoring their first points since the 2012 Malaysian Grand Prix with Vergne leading Ricciardo. Paul di Resta was the final driver to score points taking the solitary point in 10th place being unable to match his teammates pace throughout the weekend. Alonso scored his first DNF since the 2011 Canadian Grand Prix, his championship lead reduced to 24 points now leading from Sebastian Vettel who was now 2nd in the drivers championship. Lewis Hamilton's DNF also hurt his championship plight dropping to 5th in the championship standings as Kimi Räikkönen moves ahead of him. Mark Webber was not able to maximise the retirements of Alonso and Hamilton and dropped from 2nd to 3rd in the standings. With his win in Belgium it meant there was hope yet for Jenson Button in the championship however he was still 16 points behind the next highest contender, Lewis Hamilton. After the race, Romain Grosjean was found guilty of causing the multi-car pile-up at Belgium which saw Fernando Alonso slightly injured. His punishment was a severe one race ban preventing him from racing at the 2012 Italian Grand Prix, the next race on the calender. As Pastor Maldonado was unable to serve his punishment for jumping the start due to him retiring from the race, he sees a 10 place grid penalty for the next race in Italy. The final punishment of the day by the Stewards was when Caterham was given a 10 000 Euro fine after an unsafe release from the pits by Heikki Kovalainen. Michael Schumacher's 300th race (298th start). Vitaly Petrov's 50th race (49th start).